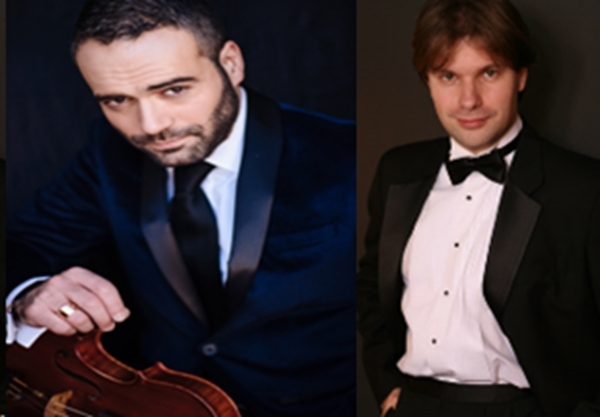 Home → Event → EMBASSY OF LITHUANIA-JESÚS RODOLFO RODRIGUEZ, VIOLA; EDVINAS MINKSTIMAS, PIANO- SOLD OUT! EMBASSY OF LITHUANIA-JESÚS RODOLFO RODRIGUEZ, VIOLA; EDVINAS MINKSTIMAS, PIANO- SOLD OUT! Jesús Rodolfo Rodriguez, viola, studied at Oviedo Conservatory in Spain, Yale University, Juilliard School, Mannes College of Music, Manhattan School of Music, and his Doctoral Music Arts Degree at Stony Brook University. His main teachers are: Wiesław Rekucki, Jesse Levine, Paul Neubauer, Nick Cords and Lawrence Dutton. Jesús has given recitals all over the world, including Carnegie Hall and the Lincoln Center in New York. He is frequently guest artist at International Music Festivals such as Music@Menlo, Bowdoin, Malaga Clasica, the Bach Festival, Chelsea Music Festival and Lucerne Festival. Jesus’s discography includes the complete sonatas for viola and piano by Paul Hindemith, and on September 2018 his second album, Transfixing Metamorphosis, will be globally released. He appears frequently in Scherzo Magazine, BBC Music Magazine, Vanity Fair, Dear Magazine, etc. In May 2011, Edvinas Minkstimas, piano, received his Doctor of Musical Arts degree from The Juilliard School, New York, where he was recipient of the C.V. Starr Foundation Doctoral Fellowship and studied with Jerome Lowenthal. He previously received the Artist Diploma from the Paris Conservatory (CNSMDP) under the tutelage of Michel Beroff. Previously, Mr. Minkstimas studied in Lithuania with Veronika Vitaite at the Lithuanian Academy of Music. He has taken master classes with pianists Nikolay Petroff, Vladimir Ashkenazy, Idil Beret, Eugene Indjic, Jeffrey Swann, Joseph Kalichstein, Marie Francoise-Bucquet, and other prominent performers, including Itzhak Perlman. He also studied composition with Guy Reibel (Paris Conservatory) and Vytautas Barkauskas at the Lithuanian Academy of Music. Program: Liszt, Ciurlionis, Rachmaninov . Buffet/wine- $95- all-inclusive.